Diane and I rented a condo on Vancouver Island in Canada for 3 months in 2015, in the town of Sidney, BC. It’s on the 4th floor, overlooking the waterfront of the Salish Sea, which is the new name for the waterway separating Vancouver Island from the mainland, including what we learned in school was the Strait of Georgia. From the waterfront walkway on a clear day one can see Mt. Baker in Washington State to the east. There’s a beautiful view over the water from our south-facing balcony, but we don’t see Mt. Baker since the building cuts off our view to the north of east, and Mt. Baker is actually a few degrees north of east since Sidney is south of the 49th parallel. But we can see the whole quadrant from east to south (and even a little more further to the west), and on a clear day we can see the mountains of the Olympic Peninsula where Mt. Olympus rises to 2427 m (almost 8000 ft) less than 100 km away. 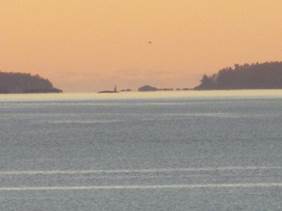 Even closer are many smaller islands between us and the mainland, the Gulf Islands. Placards on the waterfront walk tell the unique stories of some of them. 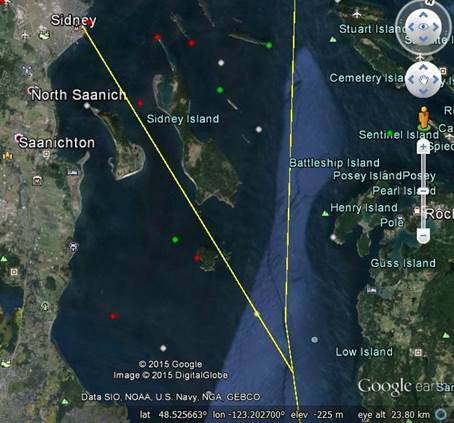 Sidney Island and James Island are closest to us, about 4 km away. During WWII, James Island had an explosives plant that produced 900 tonnes of TNT per month, a significant fraction of Allied munitions. Beyond Sidney Island across the Haro Strait is San Juan Island, part of Washington State. The US/Canada boundary was disputed after the Oregon Treaty of 1846, with an armed confrontation in 1859 and final settlement eventually in 1871. Waterfront placards tell the story of Haro Strait and the San Juan Boundary Dispute; we can see a bit of San Juan Island behind Sidney Island from our balcony. So we don’t see water to the horizon anywhere, except for what I’ve come to call “the Gap”, just a narrow part of the passage between Sidney Island and James Island and in the middle of our field of view so about southeast. Standing on our balcony, eye level is about 17 m above sea level and from the curvature of the earth I can calculate that the horizon is about 15 km away. 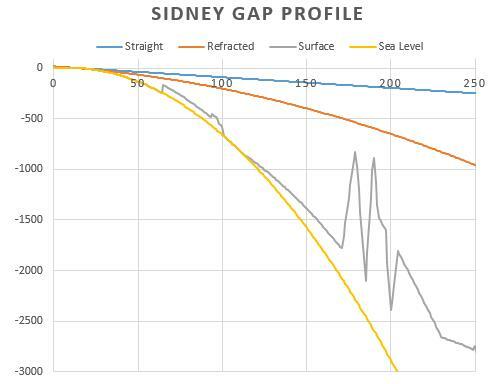 I looked on Wikipedia, https://en.wikipedia.org/wiki/Horizon, and found that atmospheric refraction is also important, so under normal conditions actually lets you see somewhat over the geometric horizon to extend our visible horizon to about 16 km. Beyond that our line of sight rises again, to a height of about h=(d/3.86)^2, with distance d in km and h in meters, corrected for normal refraction. So for example, 96 km from us would be (96-16)=80 km beyond the visible horizon and what we’d see would be (80/3.86)^2 = 20.73^2 = 430 m above sea level. If there weren’t islands in the way, this would be our view of the Olympic Peninsula, missing the lower 430 m. We first noticed the Gap in August when Britta and Kendall were here, and we wondered if we really could see to the horizon, and if so would any land beyond be high enough to be visible on a clear enough day. I resolved to look at maps and figure out exactly what direction we were looking to the Gap, and what islands framed it, since the large-scale maps we had handy showed that we could see a much wider passage between Sidney Island and James Island, about 7 degrees, whereas I estimated the Gap to be less than 2 degrees. When the excitement of a house full of people was finally behind us, I got busy with Google Earth to find the Gap with its ruler tool. I realized that between Sidney and James islands we could see two smaller islands, D’Arcy and Little D’Arcy, and the Gap between them would be about 1.3 degrees, 13 km from our balcony so closer than our horizon. I learned something interesting about D’Arcy Island too. It was used as a leper colony for Chinese immigrants from 1894 to 1924, and during Prohibition in the US was a base for bootlegger Roy Olmstead. Even within the Gap it’s not quite all water to the horizon – we can see a couple rocks or tiny islands, and a navigation beacon. I searched the Internet for a list of navigation lights, and after struggling with degrees/minutes/seconds vs. decimal degrees and a GPS file with an error (boaters beware! ), I figured out that the beacon in the middle of the Gap is the Kelp Reefs light G5337 at 48d32m51.3s and 123d14m12.7s a white cylindrical tower 10 m high with a quick 1 s flashing white light, 16 km away. I put this together with the lat,long of our balcony, 48.64957 and 123.39433 to get a bearing of 134.3 degrees, and measured the Gap from 133.8 to 135.1 degrees, about 1.3 degrees wide. What’s beyond the Gap? My subtitle gives it away – Snoqualmie! But not so fast, there’s land in the way. 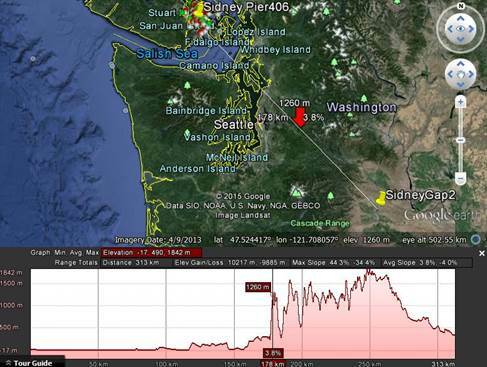 I projected the Gap bearings out to landfall, first on Whidbey Island at 65 km. At this distance, (65-16) = 49 km beyond our horizon, our line of sight would rise to (49/3.86)^2 = 161 m, but the land elevation there is at most about 80 m. What’s next? Further along Whidbey the elevation does get up to about 120 m at 96 km, but from the example above we already know our line of sight is up to 430 m by then, so we entirely overlook Whidbey. And on to the mainland 114 km away in the greater Seattle area south of Everett, then north of Redmond. 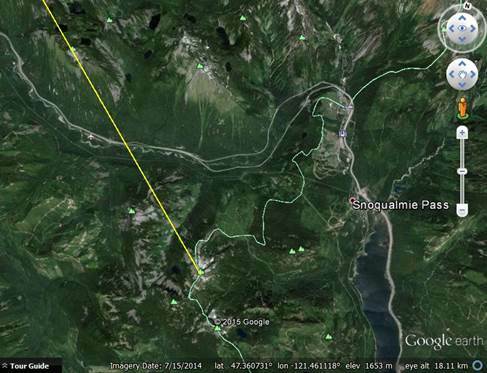 The surface is well below the line of sight until we pass the town of Snoqualmie at 170 km and come to mountains. Mt. Teneriffe, 1459 m, is below the line of sight which by this time is over 1700 m above sea level with normal refraction. More distant, Mt. Defiance rises to 1702 m but by this time we don’t see below 2000 m, and further on the topography falls away even more rapidly. Some clear days I did notice dark bumps above the horizon in the Gap, and I read about mirages. If the temperature of the atmosphere doesn’t fall with altitude in the normal way but rises in a temperature inversion, one can actually see over the horizon, a superior mirage, see https://en.wikipedia.org/wiki/Mirage. Is this what I saw? 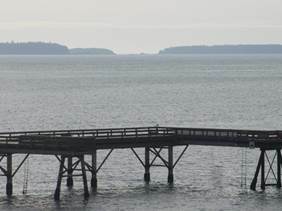 After looking on several days, I decided not, that more likely I was seeing fog banks over Whidbey Island. I was surprised how often I saw ships through the Gap, but it shouldn’t be so surprising since the Haro Strait is the main route from Vancouver to the Pacific. 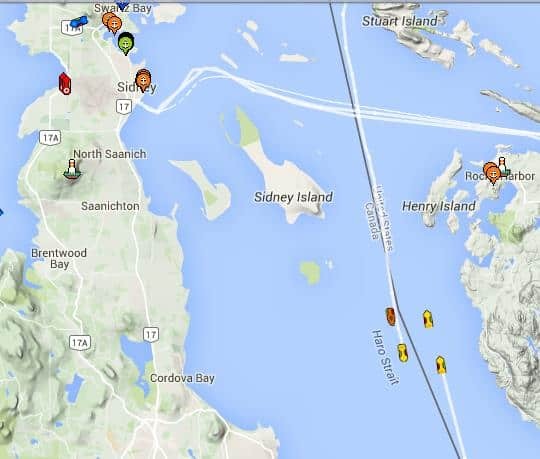 I eventually found out about a ship tracking website, http://shipfinder.co/, that shows where ships are in real time, so when I see a ship in the Gap I can find its name and where it’s going. 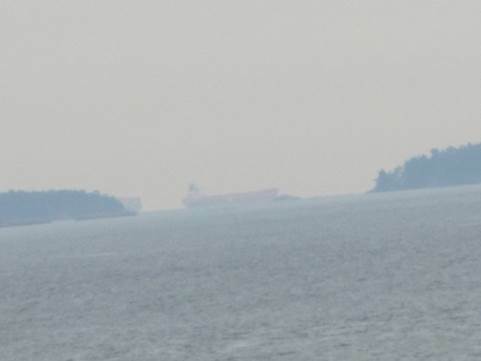 I managed to get a photo of two freighters meeting in the Gap, the Golden Rose heading south and the Frankfurt Express heading north, with just its aft end visible, coming from Yantian, China, to Vancouver. Mind the Gap!